Toxocariasis or visceral larva migrans is caused by the migration of nematode larvae to various organs. 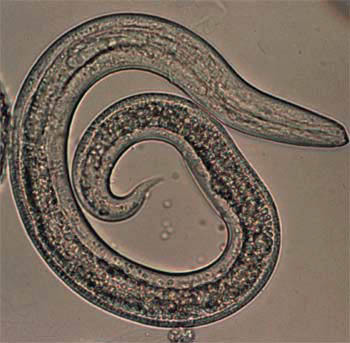 Human serve as a transport host in which larvae of Toxocara canis (dog as final host) or Toxocara cati (cat as final host) cannot develop to adult worms. Larvae may remain viable in various tissues for years. Humans (mainly children) become infected by ingestion of soil contaminated with infective Toxocara eggs in which second-stage larvae have developed. Direct infection from dogs to humans is therefore not possible. Puppies are epidemiologically the most important egg excreters. They become infected by transplacental and transmammary migration of T. canis larvae and pass eggs in their stools by the time they are 3 weeks old. In adult dogs, the infection remains dormant. In humans embryonated eggs hatch in the small intestine, penetrate across the epithelium and are then distributed via the blood in all parts of the body. In rare cases, they may cause disease.